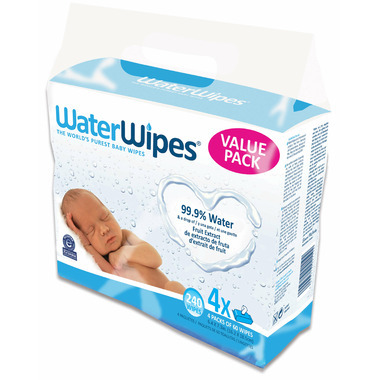 WaterWipes is made of 99.9% of purified water and a drop of fruit extract, making it the world's purest baby wipes. It has been carefully designed to be gentle on babies' sensitive skin and will not irritate it. Skin this delicate demands the purest ingredients! Excellent product. I keep these in the car for quick clean ups messy hands, spills etc. No chemical smell or residue. These are fantastic for cleaning our sonâ€™s face - he has eczema on his cheeks (not severe but consistent) and I have found any wipes with alocohol that we use on his face make him cry & his cheeks flare up - these wipes are incredibly moist and donâ€™t dry out quickly - and they donâ€™t cause him any stress when we use them on his face which is a godsend. Tried various brands and these are the best with no smell. Agree that packaging could be better, especially stacking so the dont stick to each other. My favourite wipes ever. We use it a lot when we are out with our toddler, for pretty much everything: cleaning surfaces that food will touch (plates, high chair, tables), cleaning of her face and hands before and after eating, cleaning of her toys when she drops them on the floor, etc. They are unscented, and the wipes are â€˜wetâ€™ which is great. The packaging could be better though, the plastic seal flap loses stickiness very quickly. The wipes also very often stick to each other, and you end up pulling out more than one wipe. Best wipes. Nothing toxic, just goodness for baby's skin. Excellent product - Great for travel and kids sensitive skin. I love these - they are the only wipes I will use from now on!! These are hands down, the best wipes for sensitive skin. They are also the safest. Iâ€™ve been using them for over a year now. Glad to see Well.ca carrying them.